While the Khymera project started out as an alliance between Italian producer/musician, Daniele Liverani and then Kansas singer Steve Walsh, it actually developed into a regular musical project when Pink Cream 69/Unisonic bassist and producer Dennis Ward came into the picture. While known as a bassist, Dennis always sings background vocals with his bands, so it was quite interesting for many fans to hear his voice taking the lead on the Khymera albums “A New Promise” and “The Greatest Wonder”. While the project went on hiatus for some time, it was a natural choice for Dennis to grab the reins and take complete control (both on the songwriting and on the production side) of the new album, “The Grand Design”, which comes 7 years after the release of “The Greatest Wonder”. Musically, the new album very much follows along the logical progression of the musical path that was started a few years ago. Basically if you are a fan of the previous two Khymera/Ward fronted offerings, then the third installment will be no big surprise in what you are expecting, and it showcases the fantastic vocal abilities of Dennis Ward and highlights his great skills as a songwriter and producer. The keys running through the opener ‘Never Give Up On You’ sees Khymera trying to out-Journey Journey! Think on the lines of ‘Be Good To Yourself’ and you’re not far off the mark with this tune. ‘In ‘Tell Me Something’ its Khymera’s ‘classic Bon Jovi’ era sound being achieved and Ward’s vocals are crisp and clean – no need for a lyric sheet here folks! ‘Say What You Want’ is a song I could imagine being played on the TV show Nashville, think of it as US country rock meets Daughtry. Ragno obviously takes his lead from the likes of Cain and Rolie as ‘A Night To Remember’ certainly has more than a passing nod to Journey. It’s by no way a criticism, its hard earned praise. For ‘The Land Of Golden Dreams’ Ward sounds a cross between Gary Hughes and Sambora and makes it one of the best songs on the album. For a band that practices what it preaches, then a ballad or two wouldn’t be amiss. The boxes are well and truly ticked on the heartwarming ‘Streetlights’ and ‘Where Is The Love’. It’s the former that manages to drag you in and tear you apart as it builds up to a ‘lighter-waving’ crescendo. 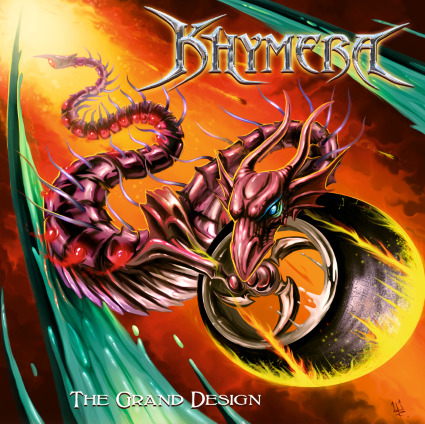 Khymera still offers one of the most shining examples of what great European Melodic Rock is all about: crystal clear production, soaring vocals, killer musicianship and songwriting that reminds fans of the heydays of the genre when bands like Giuffria, Icon, and Signal ruled the airwaves. Khymera is a worthy addition to be mentioned in the same breath as the aforementioned bands. If it was 1988 and Khymera were American then they would be absolutely massive. The US tends to stick to what it knows (lots of airplay for the classics such as Foreigner / Journey / Styx etc), if you’re reading this across the pond then you could expand your horizon and listen to a band that knows how to perform AOR at its purest form. Whilst there’s been a lot of average stuff peddled in 2015, ‘The Grand Design’ proves to be one of the better ones, and it is certainly an album that deserves many repeated listens, as few bands play melodic rock at this quality. There is enough present here to keep the AOR masses very happy indeed. Decent songs, great production, and Ward shows again why we should hear a lot more of him than we currently do. This is exactly they type of band that HRH AOR/Rockingham etc need to get their mitts on.